Frasers Hospitality has been awarded the title off Middle East’s Leading Serviced Apartment Brand by the World Travel Awards at a Gala Ceremony in Dubai. Bahrain’s Leading Serviced Apartments for Fraser Suites Seef Bahrain, Qatar’s Leading Serviced Apartments for Fraser Suites Doha and Dubai’s Leading Serviced Apartments for Fraser Suites Dubai. The ultimate hallmark of quality, often regarded as the travel industry Oscars, the World Travel Awards is the largest, most comprehensive and prestigious awards in the travel industry voted by travel and tourism professionals worldwide. “We have been committed to building a strong presence in the Middle East and are honoured to receive these awards as they are an endorsement of the region’s growing recognition and trust in the Frasers brand,” said Guus Bakker, chief operating officer, Europe & Middle East, Frasers Hospitality. Frasers Hospitality’s current portfolio, including those in the pipeline, stands at 77 properties in 41 key gateway cities, and more than 13,000 apartments worldwide. A world leader in serviced residences and luxury apartments, Frasers Hospitality has been conferred the World’s Leading Serviced Apartment Brand at the World Travel Awards. Recognised globally as the ultimate hallmark of quality and often regarded as the “travel Oscars”, the World Travel Awards is the largest, most comprehensive and prestigious awards in the travel industry. This is the first time in a 20-year history that the World Travel Awards has been extended to the serviced apartment sector. This accolade, which recognises Frasers’ commitment to excellence as a global serviced residence provider as voted by travel and tourism professionals worldwide, comes hot on the heels of other industry awards received in recent weeks. 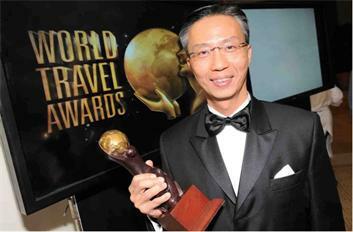 Choe Peng Sum, chief executive, Frasers Hospitality, said: “This award reaffirms the strong brand reputation we have built over the past 14 years and is testament to the distinct quality and consistency of our service offerings across our 76 properties worldwide. “Winning recognition from the industry and those who have been instrumental to our success is a great honour. Frasers Hospitality current maintains a portfolio of 76, including those in the pipeline, situated in 41 key gateway cities worldwide. Oakwood was recognized as Asia’s Leading Serviced Apartment Brand” at the World Travel Awards (WTA) Asia, Australasia & Indian Ocean gala dinner-ceremony held in Singapore. Established 19 years ago, the WTA celebrate excellence across all sectors of the global travel and tourism industry. Nominations are gathered by region and voting is carried out by an audience of 213,000 travel agents and tourism professionals from 164 countries, including visitors to WTA’s website who are encouraged to submit their votes via the online voting system.